Community Tags around SAP Business One – How to use best? Tags bring the SAP Community to life. As an essential UX element of the SAP Community, all stakeholders in Community depend on and benefit from the concept of tags. Find out what that means for you working in the area of SAP Business One. In the past, we had already significantly reduced the number of tags available for the SAP Business One area. Even though the UI of the SAP Community has already been improved in some areas, it is unfortunately not yet optimal. Now it is well usable, still I would like to give you some tips about tags in the following. On the one hand, these tips should help you to find existing content, find solutions or look up open questions. On the other hand it should explain how to best ask questions or set up blogs. To make it easier for you to browse and find the relevant tags, check the table below as an quick reference. We also added these direct links to our start page yesterday. The given links refer to the latest UI with more details. There are separate links for blogs and Q&A content as filter/switch options are missing. Best bookmark these links to tags that are relevant for you. 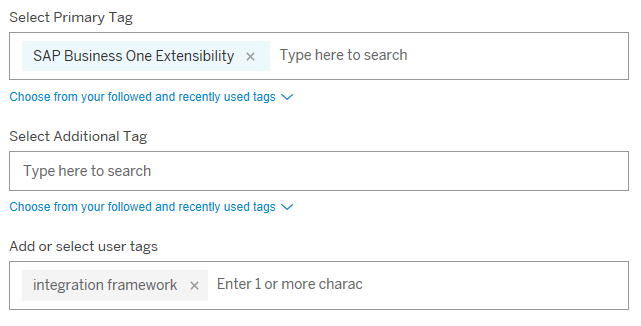 Unfortunately, the search function doesn’t work correctly yet, starting a search in a dedicated tag area triggers a search generic across all tags/products, bringing quite unusable results. As workaround I can only recommend adding “SAP Business One” (generally for every search, no matter where). So, only with proper tags you can ensure that your questions are answered on time. Please focus on these most relevant SAP tags, to be selected as primary or additional tag. 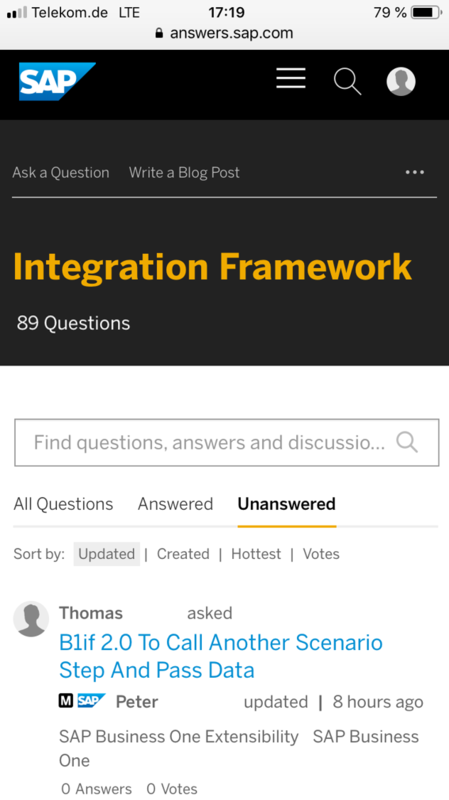 As in the case of integration framework, to add or select the most common user tag make sense, but complicating them isn’t meaningful, these individual tags cannot be consumed by others. By the way, have you also checked out the usability on your mobile device? Please let us know any feedback.